﻿ Germany 4-0 Portugal. Everything that could go wrong, went wrong! 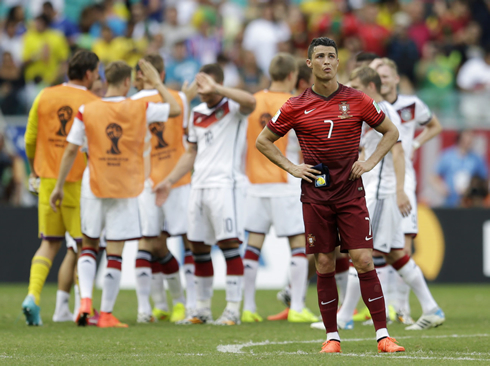 16.06.2014 » Germany 4-0 Portugal. Everything that could go wrong, went wrong! 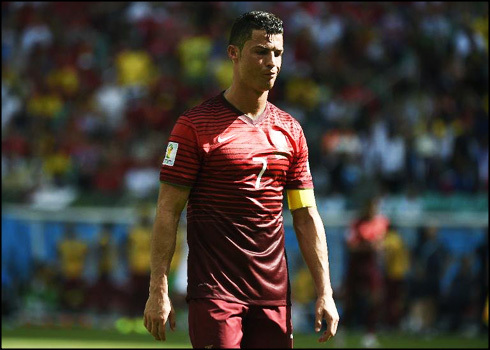 It wasn't surely the debut we've all dreamed of, as Portugal came out of their opening game in this World Cup with a very harsh 4-0 defeat against Germany. 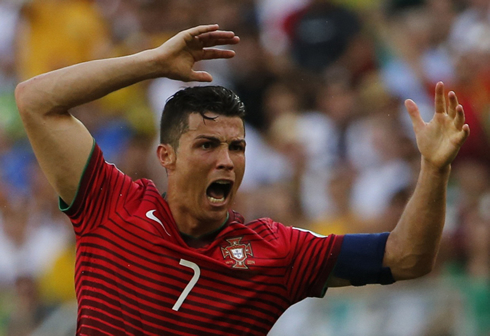 Against one of the tournament's favorites, Cristiano Ronaldo played the whole 90 minutes, but even his presence on the pitch didn't seem to have helped his side much in stopping the German's oiled machine. Bayern Munich's forward Thomas Müller bagged a hat-trick and became the competition's top scorer thus far, while Mats Hummels scored the other goal from a powerful header. 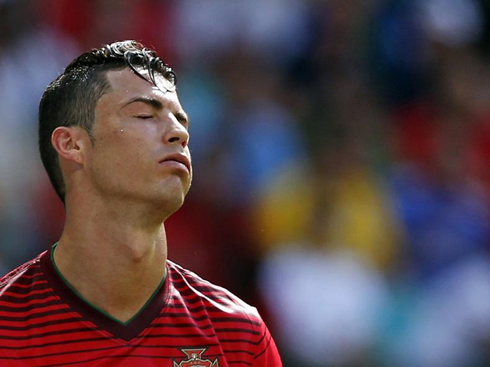 Everything went wrong for the Portuguese side, who besides having had to deal with such an humiliating loss, also lost Real Madrid's Fábio Coentrão and their striker Hugo Almerida to injury during the game. 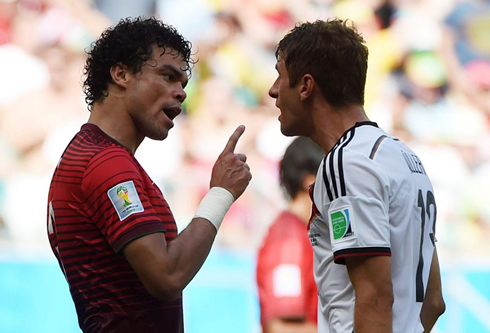 As if that wasn't enough, Pepe's red card in the first half will also rule him out of the next World Cup fixtures against both the USA and Ghana. 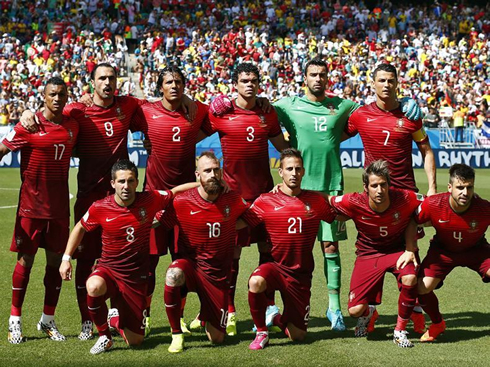 Portugal lined up with Rui Patrício in the goal, Fábio Coentrão on the left, João Pereira on the right and Pepe together with Bruno Alves pairing up in the center. 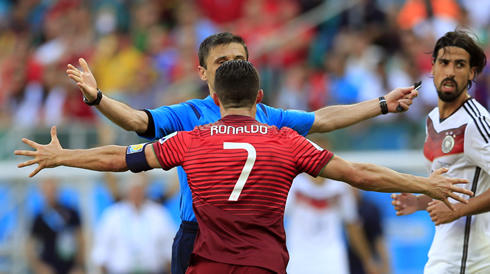 The midfield tasks were left to Miguel Veloso, João Moutinho and Raúl Meireles, while all attacking intents were delivered to the responsibility of Nani, Cristiano Ronaldo and Hugo Almeida. Paulo Bento had clearly picked a starting eleven that favored experience over youth, with their youngest player on the pitch being the goalkeeper Rui Patrício, currently aged 26. The nightmare started taking place around the 11th minute of the first half, after a good attacking move from the "Mannschaft" that ended with João Pereira putting his arms around Mario Götze when the Bayern Munich midfielder had already turned his back to him and was clearly inside Portugal's box. The referee didn't hesitate much and immediately pointed to the spot, allowing Thomas Müller to convert the penalty-kick and score his first goal of the night. In the 28th minute, Portugal striker Hugo Almeida had to be substituted after picking up an injury and to his place came on Éder, Sporting de Braga's forward. Four minutes later, Germany extended their lead with another goal, this time scored on a set-piece play. Tony Kroos took the corner kick on the right and Borussia Dortmund's defender, Mats Hummels, rose higher than everyone around him to head it past Rui Patrício and put Germany two goals up. With Portugal down to 10 men and still more than one half left to be played, chances that something positive was still to be drawn from this game were quite scarce. It certainly didn't help much seeing Germany reaching their 3rd goal later in the first half, this time on a play where it ended up being Bruno Alves messing up and delivering the ball to Thomas Müller. The German striker was quick to react and scored his second goal of the evening with a strong left-foot strike. 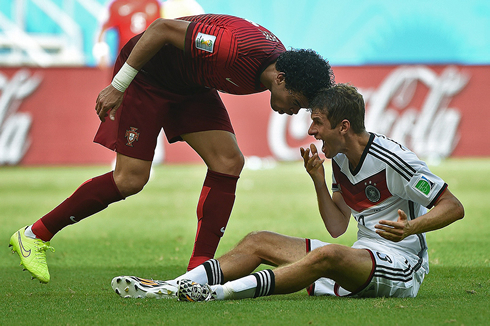 The last goal of the game arrived late in the second half and it would be Thomas Müller beating Rui Patrício once again. The 24-year old striker was basically on the right spot when Rui Patrício failed to hold on to the ball after a low cross made by Chelsea's midfielder Andre Schürrle. Being just a couple meters away from the goal line, Müller didn't waste his chance to complete his hat-trick and he sealed the final score in 4-0 to Germany. Roughly 13 minutes before that goal, Fábio Coentrão also picked up what seems to have been a muscular injury in his thigh and he's most likely out for the rest of the World Cup. Paulo Bento must now be capable of motivating a team that has been shred to pieces in their opening game and even though a 4-0 defeat is always something hard to digest, Portugal still has good chances of advancing to the last-16 round if they manage to win their upcoming games against the USA and Ghana. 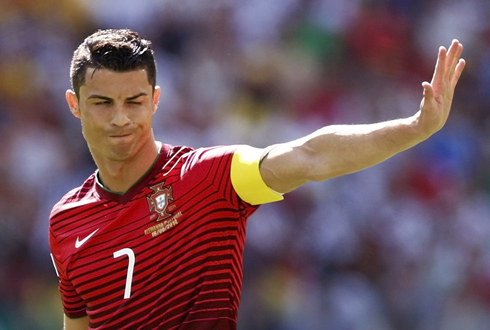 Attackers: Cristiano Ronaldo, Nani, Hugo Almeida. 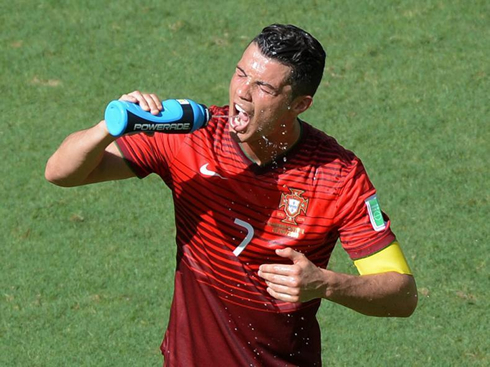 Cristiano Ronaldo's next game will be second fixture in the World Cup, on a match between Portugal and the USA, scheduled for June 22 of 2014, in Manaus (Brazil). You can watch Juventus live stream, USA vs Portugal, Spain vs Chile, Brazil vs Mexico, and Belgium vs Algeria, all matches provided from our World Cup football live streaming game pages.